Editor’s Note: This article was originally published in The Huffington Post UK on June 10, 2015. Just a stone’s throw from my own office at Fairtrade International, negotiators at this week’s United Nations (UN) climate change talks in Bonn are working around the clock to hammer out a deal for the make-or-break summit coming up in Paris this December. But as they negotiate into the wee hours of the morning, they might reflect that the strong black coffee keeping them awake is itself under threat from global warming. 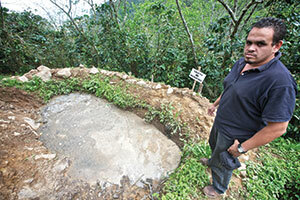 Felix Roberto Rivera, administrator at COMISAJUL, stands at an oxidation lagoon, for the environmtenally-safe processing of the acidic liquor that is generated by coffee pulp. Fairtrade rules stipulate that these waste products need to be adequately processed. We might grumble about it, but the fact is we can afford to shell out a bit more for our morning latte. Inevitably, it is the small-scale farmers in developing countries who will suffer the most. 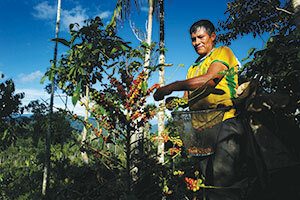 An estimated twenty-five million families worldwide depend on coffee production for their livelihoods. One Fairtrade coffee cooperative in Malawi reports that climate change has wiped out nearly half of the ten million coffee trees they have planted since 2003. In Central and South America, many farmers are tackling a devastating outbreak of leaf rust, a fungal disease widely linked to warmer temperatures. In February, I visited Guatemala and was shocked. In every discussion with every farmer, climate change just kept coming up. Coffee farmers there told us that their harvest was down by 40% – and they depend on coffee for their incomes, so imagine the impact. And it is not just coffee. Crops including rice, tea, wheat, maize, bananas and cocoa are all at risk from climate change. According to the UN, even a small global temperature increase of 1°C would lead to reductions of 5-10% in the yields of major cereal crops. Twelve million hectares of productive land become barren every year due to desertification and drought alone, affecting more than one billion people. Rising sea levels in the Ganges delta mean the soil is becoming too salty to grow rice, threatening the food security of three million people. We met bee-keepers who work in the protected Mayan biosphere, shaking their heads as they showed us empty hives: it was far too cold for that time of year, and the bees were not making any honey. At Fairtrade International, we have been setting our plans to 2020. Indeed it was the producers who put climate change on our agenda: adapting to new weather patterns is a daily reality for them. From Kenya to Peru, farmers are using the Fairtrade premiums they get from the sale of certified crops to research and invest in innovative schemes to help them combat climate change. Tea farmers in Malawi, for example, have been using premium money to plant indigenous and exotic trees in the area to improve the soil and attract more rain. Our Fairtrade Standards include stringent environmental requirements designed to encourage sustainable food production. Lucio Ordonez Sullca harvesting at the “test farm” near Pangao, Peru. Everyone in the global food supply chain has a part to play – that is why, with the help of public and private funding, we’re developing adaptation projects, such as reforestation in Peru and creating demonstration farming plots with tea farmers in Kenya, working together with partner organizations. We are also currently developing a scheme for Fairtrade carbon credits with The Gold Standard Foundation, to help make farming communities economically stronger against the effects of climate change, while enabling companies to reduce their carbon footprints. Producers will play a key role in developing the projects themselves, and they will receive a Fairtrade premium for each credit sold, which they can then invest in devising more ways to adapt to climate change. All of this will count for very little, however, if governments do not play their part. So, as those UN negotiators down yet another double espresso to keep themselves going through the night, I hope they remember that there is much more than coffee at stake – indeed the futures of millions of farmers, producers and workers around the world are depending on them to achieve binding commitments and actions in order to keep climate change in check. Organizations across all sectors talk about carbon credits, carbon offsets and carbon footprints. What does it all mean, how does it work, and is offsetting our carbon footprint through buying carbon credits really the best way to address climate change? The basic idea behind carbon credits is that a party creating greenhouse gas emissions pays for another party to engage in activities that mitigate the equivalent amount of emissions. Carbon credits and their markets are an attempt to mitigate the growth of greenhouse gases which scientists overwhelmingly agree is causing climate change. Carbon credits have long been a controversial component of government policy and international climate agreements. Development organizations are now getting into the carbon credit game to work on climate change with their farmer groups by selling credits to investment firms, allowing them to generate funds for projects related to agriculture, renewable energy, energy efficiency and forest management. There are two main goals: to decrease overall carbon emissions and to help agricultural communities increase their resilience to the impacts of climate change. Individuals that participate in a carbon credit program become more conscious of their CO2 outputs, leading them to educate themselves and take additional actions to reduce their own carbon footprints. In addition, policymakers and practitioners may be pushed to create better and more lasting solutions. Farmers in the Global South need support in dealing with the problem of climate change, a problem they did not create. Carbon credits generate necessary funding to mitigate the worst effects of climate change, so at least they do not lose their lands. Until better solutions are adopted, carbon credits in the meantime offset some carbon emissions and fund necessary projects such as reforestation. Even if it is not a perfect mechanism, it is better than doing nothing. The entry of development organizations and NGOs into the carbon credit market will lead to a focus on the most marginalized farmers, rather than a focus on plantations that support the problematic paradigm. Carbon credits push the global economy closer to full-cost accounting for CO2 emissions, allowing companies to internalize rather than externalize their pollution costs. The carbon credit market is poorly regulated with little oversight. Because of this, pricing is inconsistent and vague, there is no assurance that mitigation happens in a timely or efficient manner after payment (or at all), funded projects may create new problems (for example, reforestation with non-native species), and the entire system is ripe for corruption. Rather than compelling us to look for ways to change our habits and make the necessary deep cuts in greenhouse gas emissions, and especially to change the dirty business practices of the largest polluters, carbon credit programs can instead create a sense that we can buy a clean conscience. They help companies avoid dealing with the real problem: the damage that we are causing in the first place. The carbon credit market has led to the accelerated displacement of indigenous and agricultural communities from their lands in so-called “carbon grabs,” as investors and governments look to cash in on agricultural and forested lands. The burden of solving the problem of climate change is placed upon those who are least responsible for it. Instead of a guarantee of clean air, water and soil, farmers are paid by those who created the problem with the expectation that they now devise the solution. Let us know what you think about carbon credits. first name, city, state and country. We look forward to hearing from you.